Christmas was an important time throughout medieval Europe, and many traditions developed during this period, some of which are still popular. Here are seven things you might see during Christmas in the Middle Ages, which range from cribs in Italy to trolls in Iceland. 1) The Christmas Feast – It is not surprising that food was a major part of a medieval Christmas. The holiday came during a period after the crops had been harvested and there would be little to do on a farm. If animals were not to be kept over the winter, now would also be a good time for them to be slaughtered for their food. This could leave a bounty of food that would make Christmas the perfect time to hold a feast. England’s King John held a Christmas feast in 1213, and royal administrative records show that he was ordering large amounts of food. One order included 24 hogshead of wine, 200 head of pork, 1,000 hens, 500 lbs of wax, 50 lbs of pepper, 2 lbs of saffron, 100 lbs of almonds, along other spices, napkins and linen. If that was not enough, the King also sent an order to the Sheriff of Canterbury to supply 10,000 salt eels. Even at a slightly lower level of wealth the Christmas meal was still elaborate. Richard of Swinfield, Bishop of Hereford, invited 41 guests to his Christmas feast in 1289. Over the three meals that were held that day, the guests ate two carcasses and three-quarters of beef, two calves, four does, four pigs, sixty fowls, eight partridges, two geese, along with bread and cheese. No one kept track of how much beer was drank, but the guests managed to consume 40 gallons of red wine and another four gallons of white. Feasts were also held among the peasants, and manorial customs sometimes revealed that the local lord would supply the people with special food for Christmas. For example, in the 13th century a shepherd on a manor in Somerset was entitled to a loaf of bread and a dish of meat on Christmas Eve, while his dog would get a loaf on Christmas Day. Another three tenants on the same manor would share two loaves of bread, a mess of beef and of bacon with mustard, one chicken, cheese, fuel for cooking and as much beer as they could drink during the day. The young man who manipulated the Yule-goat had joined two poles in such a way the the upper end of one of them was provided with an oblong head looking like a goat. The jaws of this could open or close as he wished, and this made a terrible noise. And at the end of the other pole which served as the tail of the Yule-goat he put jingling bells. The young man was strong. He was covered in fur and he went inside the house and attacked every one of those present, shouting as he did do. He demanded pieces of bread or cake or cheese and when he had received these he thanked those present by moving the tail of the Yule-goat so that the bells jingled, but anyone who did not give him anything he attempted to hit with the pole that constituted the tail of the Yule-goat. When this pantomime character had thus jumped around and greeted everyone seated around the table with ludicrous gestures, he hurried out jumping as if he was dancing. 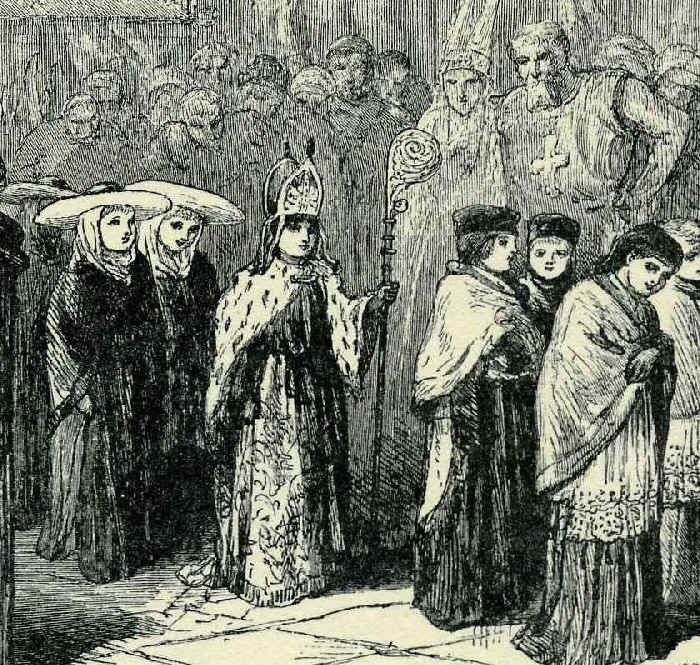 In parts of Western Europe one finds reports of the election of boy bishops, often on December 28th, which marked the feasts of Holy Innocents massacred by King Herod. In England the practice can be found dating back to the twelfth century, where boys were elected as bishops in churches or schools. The boy might be dressed up in vestments and would celebrate a mock mass that would include preaching a sermon. Afterwards he would go out in a procession, where he would receive gifts of money and food. Even the English kings would participate in the fun – Edward I had one boy bishop say vespers before him in 1299 and his son Edward II awarded another boy bishop ten shillings in 1316. Christmas Bishop is the name of a young man who is consecrated bishop in a Christmas game which goes as follows: they place one from their own guild, that is to say the guild of unmarried people, on a chair, blacken his face and put a stick in his mouth with a piece of candle on either end. Then the young men and women run around him in a circle and sign: ‘We consecrate a Christmas Bishop pro nobis”, and when this had been done three times he had been consecrated Christmas Bishop. The marriages lasted one night – we are left to guess how the happy couples spent their Christmas honeymoon. On December 26, 1396, Jehan Werry, a cloth-shearer, was in a tavern in the French town of Senlis when some of the people there convinced him to join in on their dice-game, because “it was still Christmas.” Jehan played the game, but was blatantly cheated by the other players and lost five gold francs. Jehan compounded his mistake by trying to steal money from his cousin in order to recoup his losses. In ‘Games in their Seasons’ Jean-Michel Mehl notes that in medieval France two activities often happened around Christmas, one of which was was dice-playing. Even King Charles VII (1422-1461) was once coaxed “to play dice and to make merry with during the Feast of Christmas.” Although some French church officials tried to ban this game on Christmas Eve, the practice continued and seems to have been widely played. Dice-playing can also be seen in other parts of Europe. In the Kingdom of Castile laws from the 13th century onwards mention that the royal monopoly on gambling houses was suspended for Christmas Eve and Christmas Day. Meanwhile, in 1511 England’s King Henry VIII prohibited his servants from playing various games, including dice-playing, but did allow them to play these games during the twelve days of Christmas. The tradition of creating a crib (creches) and Nativity scene has sometimes been traced to St. Francis of Assisi, who in 1223 constructed one in a cave in the town of Greccio and held Christmas Eve mass and a nativity pageant there. References to the presepi date to 1272 in Rome and 1343 in Naples, with the practice spreading to other parts of Europe throughout the later Middle Ages. 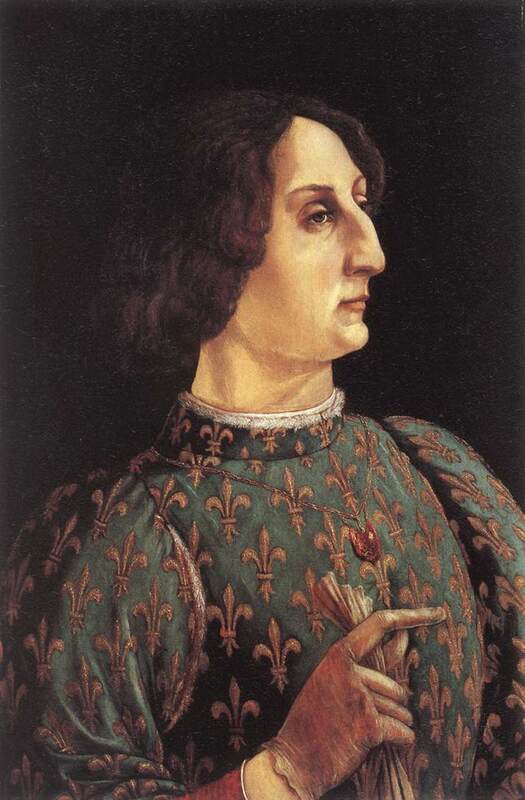 During the reign of Galeazzo Maria Sforza (1466-1476) Christmas was the most important date in the city-state of Milan. Gregory Lubkin detailed how the Duke and the city prepared for the twelve days of Christmas, seven of which were official holidays. It was so important for the Duke that he sent out orders to all the minor nobles to spend Christmas in Milan unless they were sick, along with courtiers, bureaucrats and foreign ambassadors. Having all these officials and ambassadors in one place also allowed some state business to be done, with various diplomatic efforts a fixture over the period. This was also the season for marriages between the Sforza family and other Italian and European courts to be negotiated. However, the Duke himself was often spending his time either taking in various masses or indulging in games of skill or chance. On New Year’ Eve in 1471, during a lavish party the Duke commanded that all his guests to join him in gambling, even offering to lend money to those who could not afford the stakes. 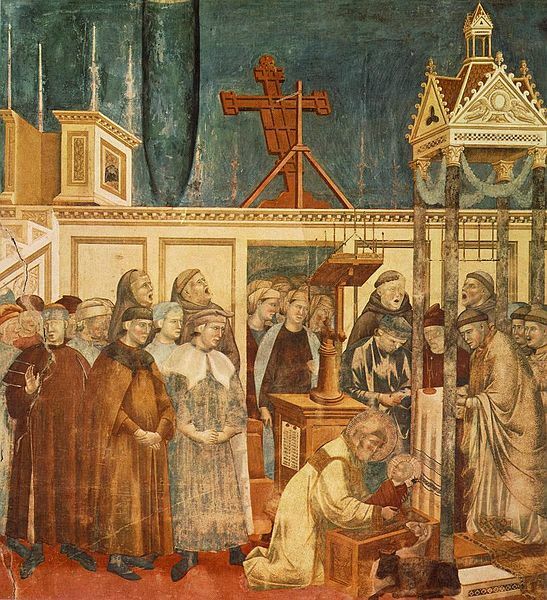 The Christmas of 1476 was held with much lower fanfare, as the Duke decided against hosting large gatherings because plague had recently been detected in Milan. Galeazzo was also worried that his own family was plotting against him, and had sent two of his brothers to France for the season. However, it was not his own family he had to worry about, as three of his own officials decided to strike against their Duke. On December 26th, Galeazzo went with a small retinue to the Church of Santo Stefano to hear mass, when the three courtiers attacked him with knives and swords, stabbing him fourteen times. Duke Galeazzo Maria Sforza was killed instantly. In medieval Iceland, the Christmas period would fall on the period when daylight would last only 4 to 5 hours, leaving for long and cold nights. It was also a time of danger, when evil creatures would wander the land. Icelandic sagas relate various strange events that happened during the Yule festival. In the Eyrbyggja Saga one farmer invited his neighbours to his Christmas feast, only to have several ghosts arrive, who would shake the mud off their clothes and spray the other guests with it. Those who tried to stop them would fall sick and die. Then he went out to his sheep. The weather was rather cold and there was a heavy snowstorm. Thorgaut usually returned when it was getting dark, but this time he did not come. The people went to church as usual, but they thought matters looked very much as they did on the last occasion. The bondi wanted them to go out and search for the shepherd, but the churchgoers cried off, and said they were not going to trust themselves into the power of trolls in the night; the bondi would not venture out and there was no search. On Yule day after their meal they went out to look for the shepherd, and first went to Glam’s cairn, feeling sure that the shepherd’s disappearance must be due to him. On approaching the cairn they saw an awful sight; there was the shepherd, his neck broken, and every bone in his body torn from its place. By the later Middle Ages the stories and beliefs about Huldufólk (Hidden people) were very common, and elves began to be associated with Christmas – they were said to be able to take over a person’s house and hold wild parties with dancing. This folklore remains popular in modern-day Iceland.